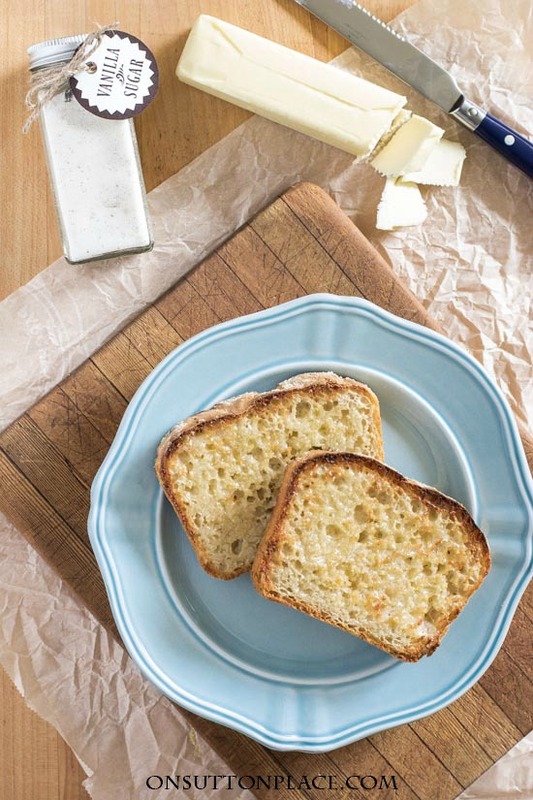 I’m not much of a bread baker…but this easy English Muffin Bread recipe is absolutely painless, there is no kneading and it’s delicious. In fact, it’s so good that I’m giving a loaf to my friends and family for Christmas…accompanied by a jar of homemade vanilla sugar. More on that later. English Muffin Bread for Gift-Giving! For the past few years, I’ve shared a bread recipe and some packaging ideas for a homemade Christmas gift. I wanted to do the same thing this year, but felt we needed a little change. Not a big change mind you…just a small one. I think this easy English Muffin Bread recipe is a lovely, made-from-your-kitchen gift for family and friends. Muffin bread that’s no knead! It mixes up in no time and what I love the most is there is no kneading…which means much less mess. It smells heavenly while it’s baking and turns out perfect every time. I’ve made three batches and I now have five loaves in my freezer. I’ve been eating it for breakfast and am hooked. 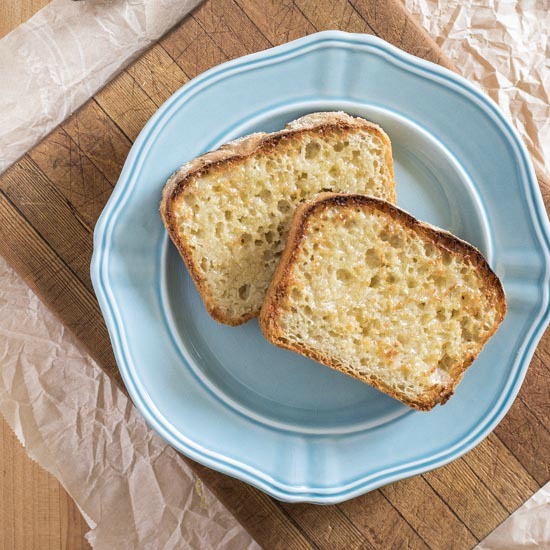 Easy recipe for English Muffin Bread that only needs to rise once. Delicious toasted! In the bowl of a standing mixer, with the paddle attachment, add half of the flour, yeast, sugar, salt, milk and water. The milk and water should be very warm but not hot or boiling. The heat from the liquid will activate the yeast. Mix together for 1 minute and then let set for 3 minutes so the yeast will activate. One cup at a time, add in the rest of the flour. Mix just until combined, scraping the sides and bottom of the bowl. Bake for 35 minutes. Bread is done when outside of loaves are lightly browned. Double check doneness by tapping on the top of the loaves. If they sound hollow, they are done. I used 9 x 5 inch, 1.5 quart Pyrex loaf pans. This recipe is a combo of several different ones I found in cookbooks and online. Some called for different amounts of the milk and water as well as different amounts of the yeast and sugar. I think this specific set of ingredients works well and the bread rises beautifully. Make sure your yeast is very fresh. If you have old packets or an old jar, pitch them and buy new. (HERE is what I used.) When I was doing my research, two of the recipes suggested baking the loaves in Pyrex loaf pans. 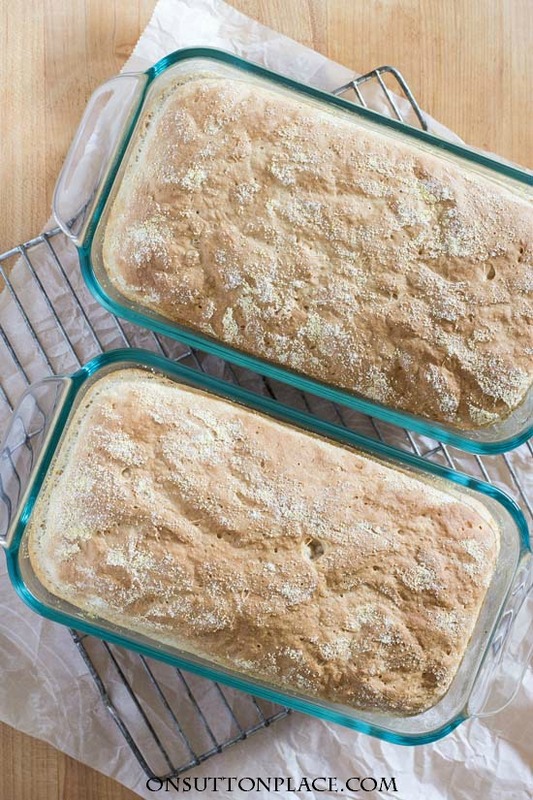 Then I remembered that my mom baked bread in old Pyrex loaf pans too…so with that thought, I ordered these loaf pans. It may sound odd, but when I was baking this bread, I felt like my mom was watching. I think I just needed to feel close to her and working in my kitchen sometimes helps with that. I’m not really sure why…but it felt good and for a little while, I was content. I can’t ask for more than that. Here are the Christmas bread recipes from the past…they all made lovely loaves of bread that are perfect for gift-giving. If you want to learn how to make vanilla sugar, just click the link below. There is nothing better than toast and butter topped with vanilla sugar. It’s the best! 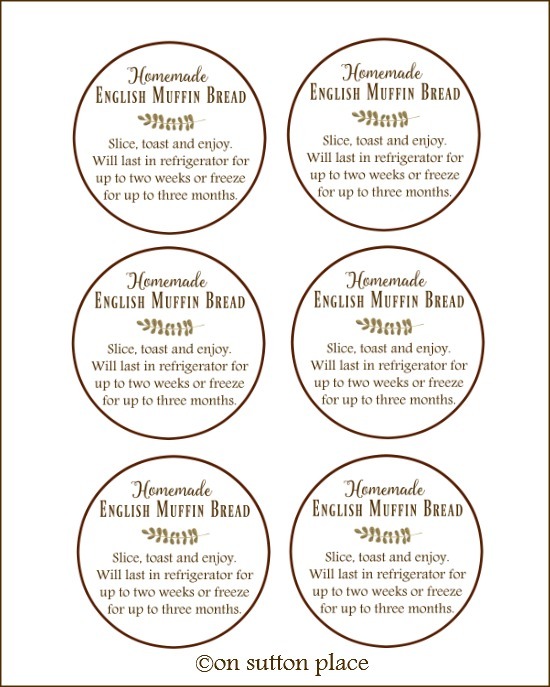 Edited 12/15/2016: I made a free printable tag for the English Muffin Bread. Click HERE to download. Click HERE for easy packaging ideas that make holiday gift giving easy! I have made this English Muffin Bread now many times and it is the only bread recipe I like. It is so quick, easy, and delicious. With that said, although we are trying to eat healthier by cutting out most salt and sugars, I actually seem to like this bread with double the amount of salt and sugar. Before this recipe I would only eat nutty whole wheat breads, but now to my surprise I prefer this one with my breakfast every morning. I hope to find this recipe with a twist possibly made with herbs (I experimented on my own :( without success). My fingers are crossed. Thank you for this recipe. I love, love, love English Muffins, so I can’t wait to try this bread! And a nice introduction to Fall; all the good smells. I love FALL! And I love your site. All your things are lovely. How important is the corn meal? Hi Emily! Not really important…it just adds a little texture. It would be fine to leave it off. Enjoy the bread! I simply love your blog and follow you religiously. I love your recipes and can’t wait to try this bread recipe on my family on Christmas morning! Thank you for all you share with us. I made apple butter and fresh strawberry jam. My mom loved English Muffin bread. Made it all the time. In honor of her I am to pair with the items I made. The labels are great and there is no mistake how to use it. Merry Christmas Ann. I miss my mom very much every day. I made this bread for my hubby yesterday and he loved it! Had it again this morning as toast and again it was wonderful. Came on your site to compliment you on sharing the recipe and noticed that mine had the sugar omitted – as someone else mentioned. It tasted great anyway! Hubby is diabetic so it worked out fine leaving the sugar out! Thanks again for sharing this awesome recipe with us! I don’t know how this one got past me, Ann, but I cannot wait to start baking! This looks and sounds like satisfying comfort food. The texture and crumb of the bread are gorgeous. One wonders how something so delectable could come from such a simple recipe! You have solved my problem Ann! I have a few people I always gift with baked goods each Christmas. This year, I wanted to do something different than Christmas cookies, breads, cinnamon rolls I usually give. I know every person on my “baked goods” gift list will savor every last crumb of this bread! Thank you Ann for knowing what I’m needing sometimes before I even know it. Oh my, that bread looks amazing! I cannot wait to make it. I have never heard of vanilla sugar, but it is also something that I am going to try. Might be what our neighbors get for Christmas this year too. Thanks for the great ideas. Love, love, love your blog!! Merry Christmas Ann. My husband made your English Muffin Bread (using skim milk) and we both love it! Thanks for the recipe! I fell in love with English Muffin bread 20 years ago. I would buy a loaf at the local bakery when I’d visit my parents in Indiana, then carry it on the plane. Years later my mother had a recipe to share with me. I’m anxious to try yours because it looks so delicious. Do we need to use whole milk in this recipe? Can’t wait to try it ! No…I used 2% but I think even 1% would be fine. I wouldn’t use skim milk though. Well I am making it! let ya know how it goes. Happy Thanksgiving. Hi Ann! Thank you for this easy recipe! I made the bread today and served it with my husband’s homemade split pea soup. We both really enjoyed this bread and look forward to having it for breakfast tomorrow! Just a note that the sugar is omitted in the instructions I printed. Also, your readers may like to know that the yeast called for is equivalent to two individual packets of dry yeast. Have a wonderful Thanksgiving! I’m not sure what’s up with the missing sugar ingredient. It’s listed in the printable recipe and when I printed it all was well. I’m sorry for the trouble! I love English Muffin bread and have made it for years. I am going to follow your lead and bake multiple loaves and keep in the freezer! Why hadn’t I thought of that sooner?!? What can you use if you don’t have a standing mixer with paddle attachment? Could you mix by hand? Haha! I totally agree Diana…I only ever eat the real thing. I figure life is too short to eat fake butter! I enjoy receiving your emails thank you. Thank you Ann! Bet it would be good with cinnamon sugar on top too. Have a Happy Thanksgiving! I am going to try this recipe as well Ann. In fact I love all your loaf recipes! I have been a follower of your Blog for a very long time now and simply love all your creative, simple fun style ideas, frugal tips and DIY’s. I do have a question regarding the cornmeal though, it does not say (at least on the printed version – how much to use? Really looking forward to this year’s “wrapping” post(s). The cornmeal is just for dusting. I took a spoon and dusted the baking pan and then did the same thing on the top of the loaves. 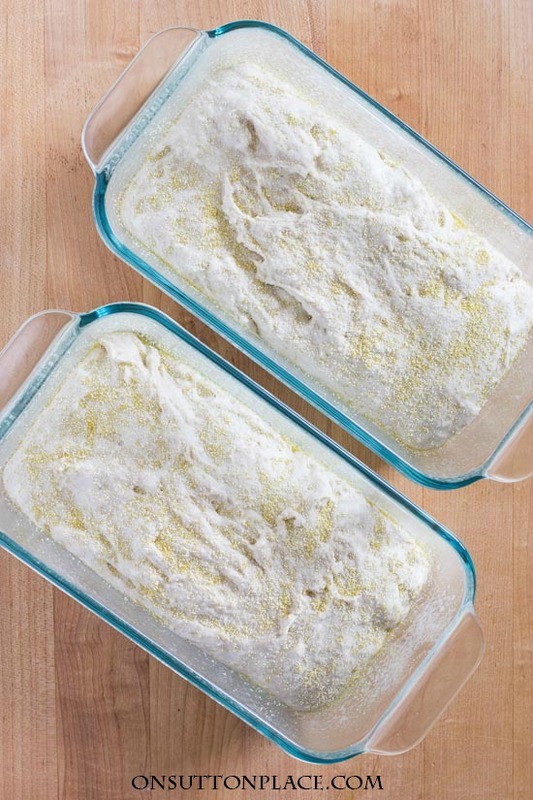 Total for two loaves you might only use 4 or 5 tablespoons. Enjoy! Thank you so very much for this recipe (English Muffins)! I can’t wait to make these loaves which are such a brilliant idea to tuck in with the usual cranberry, pumpkin, and nut loaves over the holidays. I discovered homemade English Muffin Bread in one of my cookbooks (either Betty Crocker or Better Homes & Gardens–one of the binder ones) a few years ago. It really does come together quickly and is the BEST for having alongside a bowl of steaming soup or for breakfast as you mentioned! 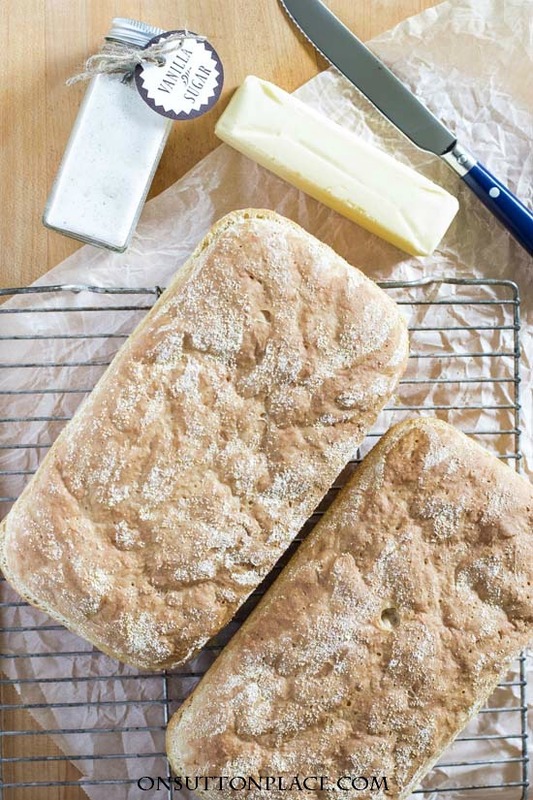 Totally addictive and really the easiest homemade bread out there. It changed the world of English Muffins as I knew it. The bread never lasts long in my house since we gobble it up, but how long can it keep for if you plan to give as gifts? What instructions will you include with the bread? The bread lasts for up to two weeks if refrigerated. I hadn’t thought of including instructions but if you wanted to perhaps just attach a note that says “Slice, toast and enjoy. Will keep in refrigerator for up to two weeks.” If you want to wait a bit I can make little tags as a free printable. I’ll put that on my list! I love your idea of giving this bread as a gift for neighbors and friends. Something different than the typical Christmas cookies and sweets that we eat so much of. I made your English Muffin Bread today, easy peasy but it took about an hour to get it to rise to the top of the pan. When I moved the pans from the counter to the oven, both breads fell! So my bread wasn’t nearly as large as your loaves but they still tasted delicious. I’m a pretty good baker so I’m not sure why they fell. I have been following your blog for over a year now… I love your authenticity! I’m not one to write comments but today decided I would. I know this year has been a difficult year for you and I’m convinced your mother was right beside you while baking this English bread muffin recipe… No doubt about it! Thank you for all your lovely posts and am quite anxious to try this recipe. Last year at Christmas time I tried other loaf recipes which were part of my gift basket to dear friends. Take good care and thank you! Thank you for writing Marie…and thank you for your kind words. They made my day! Thank you for the great recipe! Can’t wait to see your packaging ideas. I’m always looking for unique and new ideas for packaging! Happy Thanksgiving to you and your family. Yum!!!!!! Anxious to try your recipe. I like to bring a gift with me when I visits friends. This will be perfect. I think I need to replace my yeast before I attempt your English muffin bread. to let you know, when I hit the print button for the English muffin bread, a red page came up saying On Sutton Place was an unsafe site and my security program refused to allow it to open. Thought you would want to know. Would really have liked to print out the recipe. I’m happy to hear that you were comforted while baking and I’m praying that you’ll find similar comfort in other holiday tasks and activities this holiday season. This looks delicious! Pinned and printed! Namaskaram Ann, I am scared – I cannot bake :) but this looks and sounds so delicious that I most certainly will give this a try this week; fingers crossed. Your photography is so inspiring and I like the idea to give this bread away with home-made jam/marmalade to family and/or friends. This recipe came at the perfect time! I was sitting here trying to think of a unique idea as a “go with” gift for my mom. She is a bread fanatic and LOVES English muffin bread! I’m not much of a cook, which is a well known fact in my family, so making this recipe will surely impress! Sounds delicious ! And a lovely gift indeed. Do you think, or did you try making this bread with bread flour? Am wondering if it would make a difference. Wondering if you attempted baking the English muffin bread with bread flour? My mom used to make this bread also. Yesterday was her birthday. I know God gave her a grand party. I made home made strawberry jam and apple butter jelly. This bread will be perfect to go with them. 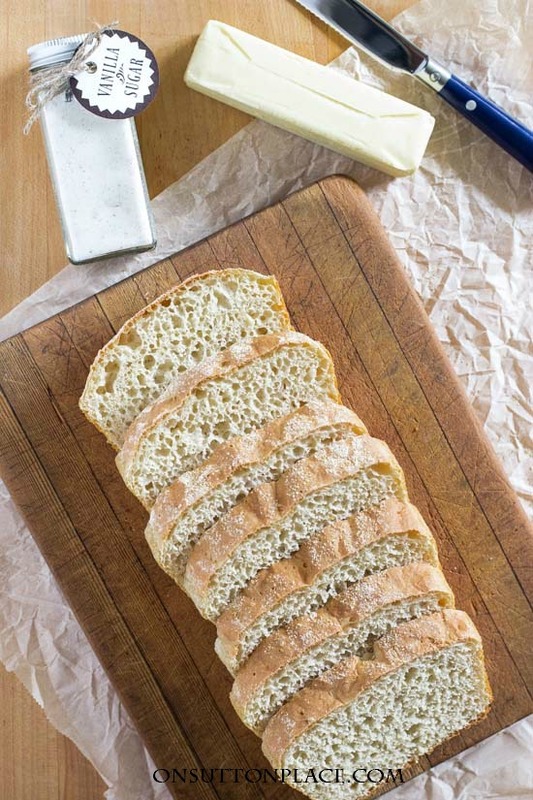 I’ve been “pinning” bread recipes this morning so this one is right on time! Thank you so much, I’ll be making this really soon. 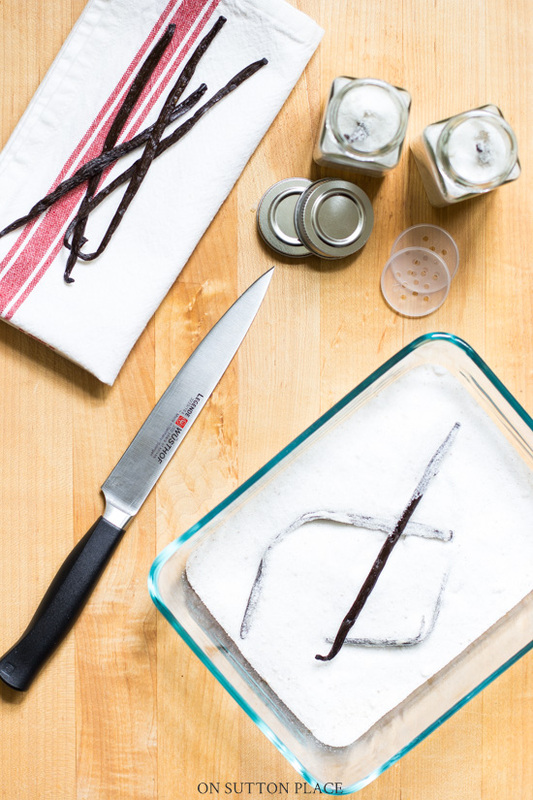 I used your directions for making vanilla last year and gave it as gifts – it was wonderful. Thank you for the wonderful English muffin bread recipe. I’m going to make it for Thanksgiving breakfast! I’m also going to make the cranberry citrus bread! 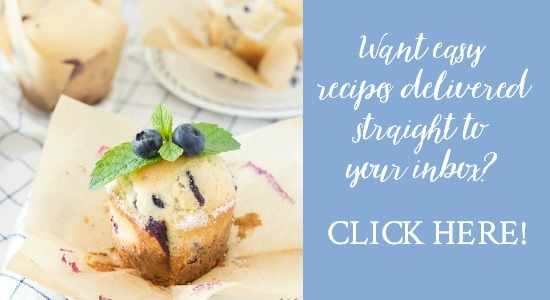 These are terrific recipes! I can’t wait to try them! Happy Thanksgiving to you and your family!???? 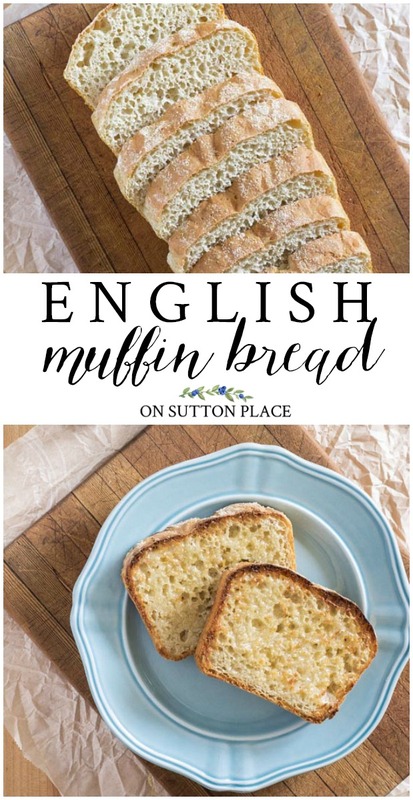 My husband loves English Muffins so this will be a must try…can’t wait to see your wrapping ideas. Have a wonderful Sunday! This sounds so good and I want to try baking some for gifts. Do you use plain flour? Ann, I know exactly how you felt about your mom watching. Often I’ve had that feeling when I’m in the kitchen or sewing as both were skills my mom taught me. I like to think it’s a spiritual connection of a thread that can’t be broken. Sometimes just walking down the baking aisle can bring on a memory and make me teary eyed! My mom also made English Muffin bread and I have her recipe. She used the microwave which was unique because it gave it that pale appearance that English Muffins have. I’ve made it both ways. I will Pin and try your recipe too. We are lucky to have these ties to our mom. I cannot wait to try this. My hand is still not healed but I’ve been making lists of what I want to do once it does heal. The bread sounds wonderful. I’m wondering if anyone has baked any gluten free versions of any of your breads, using 1 to 1 gf flour. Sounds delicious – thanks for sharing.